The Americas Best Value Inn Wisconsin Rapids includes more of what you want when traveling across Central Wisconsin. Complimentary high-speed Internet access-microwave and mini-fridge in all guest rooms - we have it. Free continental breakfast with hot waffles is set up for you to enjoy every morning. Kids 12 and under stay free in the same room as a paid adult. Pets are allowed charges and restrictions apply. The Americas Best Value Inn Wisconsin Rapids is your best value in Central Wisconsin. Our 100 percent smoke-free property is minutes from major corporations such as Ocean Spray/ Domtar/ New Page Corporation and ECC Corrosion and is centrally located amidst a small town rich in heritage/ midwestern hospitality and natural beauty. 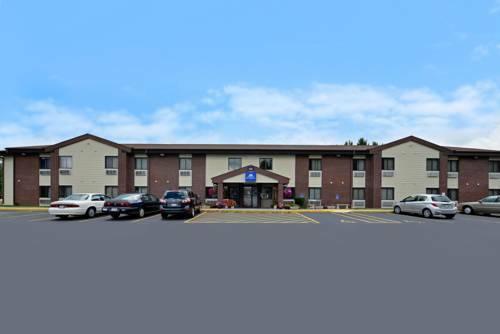 Whether you are traveling on business/ attending a youth hockey/ wrestling or baseball tournament or exploring the history and colors of the Cranberry Highway/ let Americas Best Value Inn be your place to call home. If playing a round of golf at the Ridges Golf Course/ or trying your luck at the casino is your passion/ we have special golf rates/ a free casino shuttle that runs Monday through Friday and rewards play packages available - just ask. Most importantly/ we pride ourselves on our great service/ exemplary cleanliness/ and your comfort. Everything we do at the Americas Best Value Inn Wisconsin Rapids is driven by our desire to provide excellent service/ dedication to detail and a friendly/ comfortable environment. Join our family at the Americas Best Value Inn Wisconsin Rapids and experience an exceptional property with an outstanding and accommodating staff. Americas Best Value Inn is conveniently located on Hwy 13/ south of Hwy 54. Our address is 3410 8th Street South/ Wisconsin Rapids/ Wisconsin 54494. One of several similar fountain statues of mysterious origin around the U.S. and elsewhere. This 4-ft. tall, hollow metal sculpting of a young boy holds aloft a leaky boot that dribbles continuous streams of water. Stands at the fire department. ~16 miles from Wisconsin Rapids. "Concept" fun house attraction that won't help you understand how government works. Or maybe it will. Presidents and aliens, together at last. ~51 miles from Wisconsin Rapids. Displays the contents of Cranberry Expo, an earlier cranberry discovery attraction. Ice cream parlor serves six flavors of cranberry ice cream. ~37 miles from Wisconsin Rapids. Where Interstates 90 and 94 split, one to head west toward La Crosse and Rochester, the other to go north toward Eau Claire. ~40 miles from Wisconsin Rapids.